A man speaking at a New York meeting concludes by saying, "This country can't survive much more of YOUR kind of democracy." 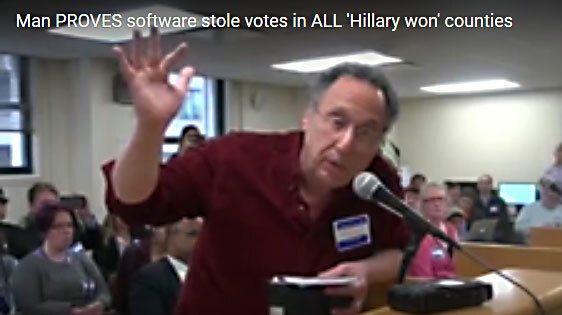 He reveals in his short presentation that the boxes and software used for elections in the five New York boroughs use proprietary software that makes the votes and voting unaccountable to anyone but the two companies hired to administer them—as they are allowed to count votes in a completely "untransparent process." He also states that results are untestable and further do not reflect voting polls by large margins which is statistically impossible—and that a shift of even 2% indicates fraud according to the US State Department. He makes it completely evident that the voting process is rigged. This is just another shameless example of the downward spiral of this nation at the hands of a completely corrupt few. Left Verses Right: Astounding Change On Illegal Immigration In 20 Years!